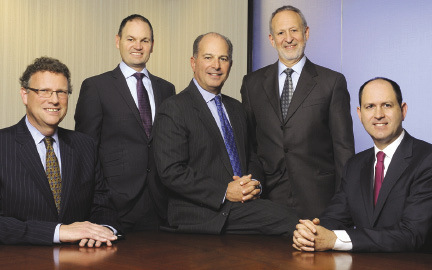 Shown (from left) are Schulte Roth & Zabel's real estate partners: Cybul, Wise, Lenobel, Nash and Brozost. As 2013 comes to a close, the real estate group at Schulte Roth & Zabel LLP (SRZ) is looking back on a year that saw a booming New York City commercial real estate market, which directly paralleled an exceptionally active period for the real estate practice at SRZ, a full-service law firm with 375 attorneys, founded in 1969. Indeed, the group is celebrating a landmark year, having served as the legal architect behind some of the most significant development and acquisition deals in New York's history. Those achievements included deals developing Hudson Yards, MoMA Expansion Tower, Quin Hotel, InterActiveCorp headquarters as well as other iconic structures. Comprised of more than 20 attorneys, SRZ's real estate group is led by partners Jeffrey Lenobel, Marshall Brozost, Bruce Cybul, Robert Nash and Julian Wise, and is well-known for its expertise in executing complex commercial transactions on behalf of clients worldwide. "We take enormous pride in our work and the continuing growth of our practice," said Lenobel, chair of the real estate group and member of SRZ's executive committee and operating committee, whose practice focuses on real estate restructurings, development, finance, sales and acquisitions. "We have a long history as a leader in the industry and that is the result of years of hard work and dedication serving our distinguished clients." SRZ represented the joint venture of The Related Companies and Oxford Properties Group that is developing Hudson Yards. This 26-acre, $15 billion master-planned development project in Manhattan is to be leased from the Metropolitan Transportation Authority (MTA), and developed in two 13-acre phases with the second phase anticipated to be leased by the joint venture from the MTA in 2014. Additionally, SRZ advised the joint venture on financing and investments in the first building to be erected at Hudson Yards Â­- a 47-story office tower that will serve as the corporate headquarters of Coach - in which Coach will own an interest in and fund a portion of the development and construction costs for the nearly $1.4 billion construction financing and equity investment. 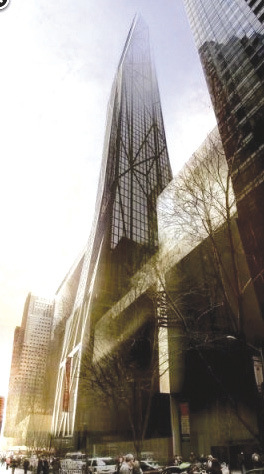 Another notable transaction was SRZ's representation of the Museum of Modern Art (MoMA) in engineering the deal for the MoMA Expansion Tower in Manhattan, which will become one of the city's tallest skyscrapers at 1,050 ft. and 78 stories. Only the new World Trade Center, Empire State Building and Bank of America Tower are taller. SRZ's project list also includes the InterActiveCorp headquarters, best known for its distinct curved glass-curtain walls. The structure was developed by the Georgetown Company, which SRZ has advised for many years, and is the first Frank Gehry-designed office building in the city. "It has been extraordinary to be a part of developing some of the more interesting and complex deal structures in the industry. 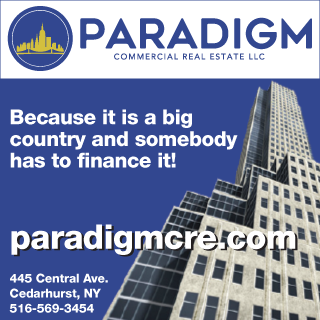 Every project presents new opportunities for our practice group to expand our reach and that is incredibly rewarding," said Cybul, who along with the other members of the SRZ real estate group represent developers and owners, private equity investors, investment bankers, commercial bankers and hoteliers, among others. Those clients include UBS Realty Investors, which SRZ represents in its equity ownership interest in the historic Buckingham Hotel (at 57th and Avenue of the Americas). In November, the building was reopened to the public as the Quin Hotel. In the hospitality industry, SRZ also represented Kyo-ya Company Ltd. in several complex financings involving hotels and resorts in California and Hawaii. And most recently, SRZ represented the borrowers in the refinancing of the 51 hotel portfolio of the Innkeepers USA Trust. An established leader in the investment management community, SRZ's real estate group advises prominent private equity funds in their real estate investments, providing a full breadth of services. 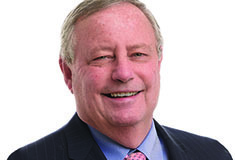 As an example, the group worked with attorneys from the firm's other practice areas in the completion of two of this year's largest real estate deals - the $3.3 billion acquisition of publicly-traded SUPERVALU's Albertsons, Acme, Jewel-Osco and Shaw's; and the $1.5 billion sale of LNR Property to Starwood Property Trust and Starwood Capital Group. For those major projects and more, the SRZ real estate group has been recognized by industry ranking publications including Chambers, The Legal 500 United States, Best Lawyers in America, IFLR Best of the Best USA, IFLR Guide to the World's Leading Real Estate Lawyers and New York Super Lawyers. Through a combination of specialized legal expertise, unparalleled market knowledge and extensive experience, the SRZ real estate attorneys are considered among the most trusted and skilled in the industry.